On Wednesday, December 19th, 2012, an ENS was published from Chief Garcia with regard to having officers raffirm their oath of office annually. Not surprisingly, this generated concern from many officers who believe they should not be made to re-take an oath of office that they took when they were first sworn in as officers right out of the academy. PLEA fielded several calls from officers wanting to know what would happen if they refused to participate in reaffirming their oath of office. 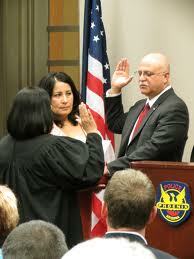 On Thursday, December 20th, 2012, PLEA President Joe Clure spoke with Chief Garcia to obtain additional information on the topic. During this conversation Chief Garcia made it clear that the reaffirmation of the oath is highly encouraged but NOT REQUIRED. The Chief also made it clear that DISCIPLINARY ACTION WOULD NOT RESULT if an officer opted not to take the oath.